One of the most important parts of someone’s religious journey is the place that everything starts. That’s right, his/her baptism. Attending such an event is one of the most special moments you can experience. Being present at the moment that an amazing creature gets to accept Jesus as their Savior, is the beginning of an astonishing journey. But, on occasions like these, it is expected that you have some wishes prepared, be it to the child, be it to the parents, or to anybody. Wishing something to someone is the most direct way to express your feelings, by literally telling them to the other person. But if you are like any other normal person out there, you don’t have the time to sit down and start thinking about wishes. You have to prepare your outfit and all that. But worry not my dearest friend, because we have already done all the dirty work for you! So here are the best baptism wishes on the internet! This truly is a day to be remembered. May the Lord be graceful to this young angel for the rest of eternity. May the love and grace of God always be with that child. Congratulations on this extraordinary day! I feel blessed to be able to attend an occasion such as this one. Our Lord has enough love for all of His children, so I’m happy to see that our community is growing bigger! Today marks the day of the start of this child’s spiritual journey. May God give all of His blessings to that sweet child. My most sincere wish for that little child is that everything works out in its favor while growing up, and may it have our kind Lords blessings! May today be an unforgettable occasion for every single one of us. Because it is the day the sweetest child in the world joins our lovely Christian community! Let our kind Lord be the guiding light in the life of this sweet child! I cannot express how thrilled I am to be attending the start of such a spiritual journey. I’d like to wish that this baby has the most amazing Christening that has ever been done. Because with such amazing parents, that child deserves only the best. 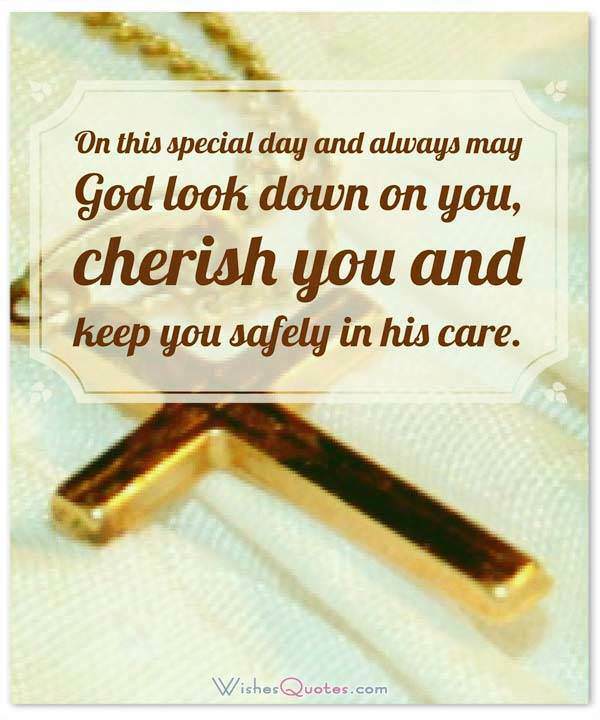 May this day bring never-ending peace and joy to the family of that sweet angel. Happy Christening! There truly is nothing better than the smile of a sweet angel about to start such an amazing spiritual journey. I feel ecstatic to be able to attend such this occasion! 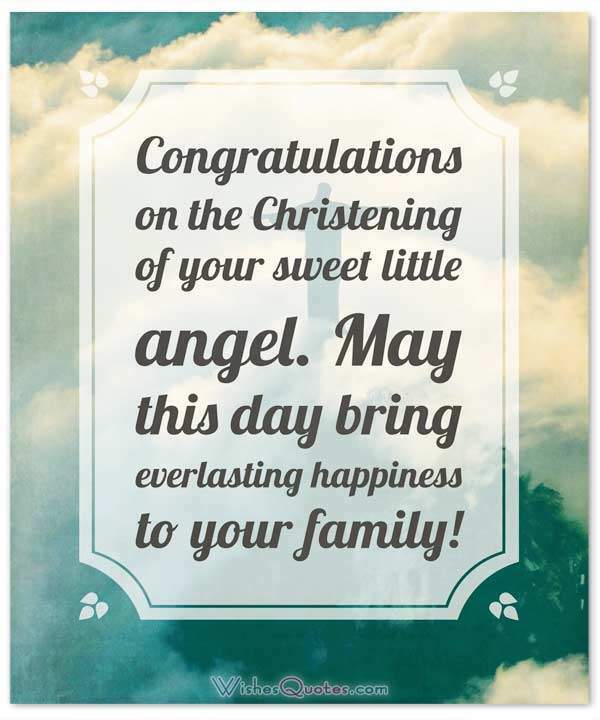 Congratulations on the Christening of your sweet little angel. 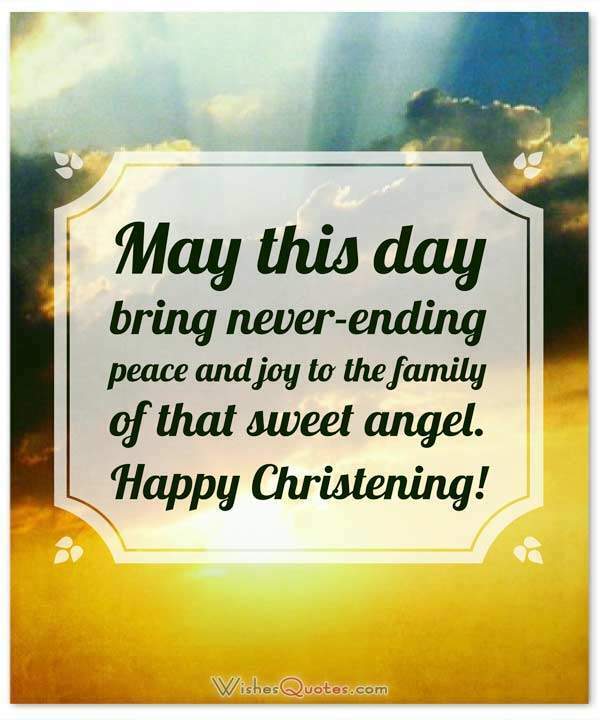 May this day bring everlasting happiness to your family! Judging by the parents, that child is going to grow up to become an amazing person. I can’t wait to be there when that happens. 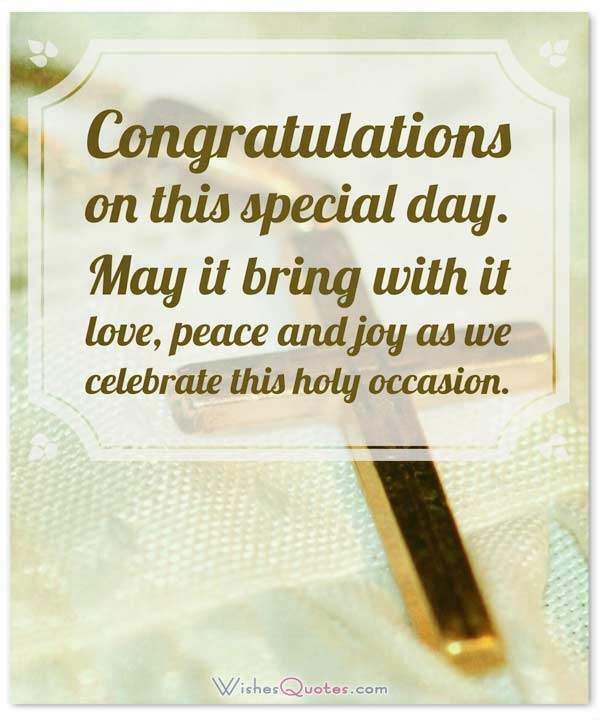 Congratulation on your child’s Christening! On this special occasion, I truly hope that your child becomes blessed by our Lord, so that everything works out perfectly in its life, and yours. 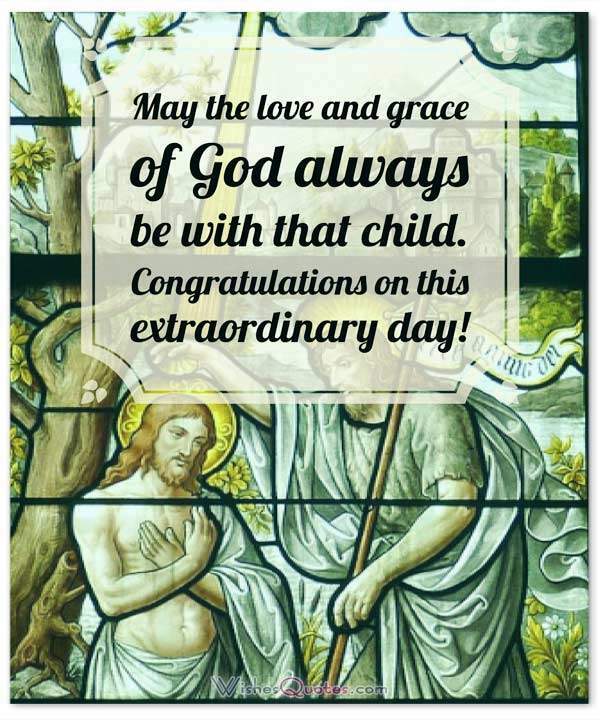 The very existence of this child is a gift from our Lord, so this Christening is a way to show our appreciation to Him. Congratulations! Raising a child in a Christian society is not easy. You have to provide it all the principles set by our dear Lord. But, this special day, is like the welcome party to the new life this child will be living from now on. The Christian Life. Congratulations! The Christening of a baby, is as important as a day for the parents at it is for the child. I cannot even fathom the happiness you two must be feeling right now. I sincerely hope that God blesses your family with peace and joy. Congratulations! This day marks a huge milestone in this child’s life. It is the day it was brought one step closer to God, by accepting Him into its life. And for you to allow then, you must feel proud of yourselves as parents. Congratulations! As your beloved child is presented to our graceful Lord, may He bless him/her with never-ending happiness and peace. Congratulations! You should really feel proud as parents. Your child is now a part of something much bigger than any of us. It has become a part of the Christian community, and I am pleased to welcome it besides us as our brother/sister. Congratulations! Dear child, I promise to do everything in my ability to make sure that you grow up to become the best person in the world. My beloved child, I promise to help you maintain your faith while growing up, to ensure you become the good Christian you are supposed to be. My best wishes to you. I cannot describe how honored I am feeling for being the person that ensures the faith of this child remains intact, and always focused towards our Lord. I vow to you, my dear child, that I will be the best godfather/mother you can possibly imagine. Dear child, may the heavens bless you in any way possible, so that you can one day become the person you will dream of becoming. And I promise you, as your godparent, that I will do everything in my power to ensure that your dreams will come true. Your existence is a blessing to our lives, and I feel honored to be your godparent. No matter the hardships, I promise that I will always be here for you, making sure you have a smile on your face. My beloved child, I pray that the day of your Christening, marks not only the start of your spiritual journey, but also the start of everything good this life has to offer. My dear child, I’d like to promise you, that no matter what happens, as long as you live and breathe, we will always be there for you, to make sure that you remain faithful and kind, as you are now, as a baby. May this christening be a signal that the rest of your life will be blessed by His grace, and that you shall be watched over by the Holy Spirit. I pray that our dear Lord, blesses you with a lifetime full of happiness and peace, and a bright future, which I can’t wait to be a part of. You see, every single day, the Lord gives us a reason to celebrate, and feel blessed. Today, that reason is your Christening, and as your godparent, I could not be feeling more proud! I vow to you that I will always be by your side, and be the best godparent this world has ever seen! “Whoever welcomes a child in My name, welcomes Me.” – Luke 9:46-48.